Greenpeace is taking action all over the world for our planet’s future. We need individuals dedicated to the hard work and professional standards that millions of members worldwide expect of the world’s leading environmental campaigning organisation. As a Greenpeace employee, you can expect to contribute to and be part of an important program of work to stop climate change, save the ancient forests and protect our world’s oceans, earth and sky. Greenpeace International employs more than 150 staff, from all corners of the globe, all dedicated to meeting the professional standards expected of the world’s leading campaigning organisation for the environment. From our Amsterdam office we lead global campaigns and provide strategic support to our national and regional offices, funded by millions of members worldwide. We are therefore looking for dynamic team players who want to make a difference. We welcome aboard the people who run our well-known campaigns, actions and ship unit staff, as well researchers, fundraisers, press officers, political, legal and human resources advisors, finance specialists and many more. To find out about current vacancies and how to apply, visit our international site. Greenpeace has offices around the world and volunteer participation varies from office to office. Visit the web sites of Greenpeace offices worldwide. Sailing aboard a Greenpeace ship can be the experience of a lifetime. We are always looking for motivated, skilled and experienced crew. 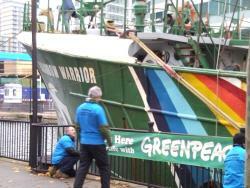 The fleet of Greenpeace ships and their actions are coordinated by Greenpeace Marine Services in the Netherlands. As you can imagine we also receive many applications each day. If you have experience at sea and hold the appropriate and valid STCW95 licenses then you can apply online for a paid position on board our ships. We offer paid three month tours of duty coupled with exciting campaigns. If we cannot offer you an immediate opening we can still keep you on our prospective crew database which we refer to whenever we are in need.